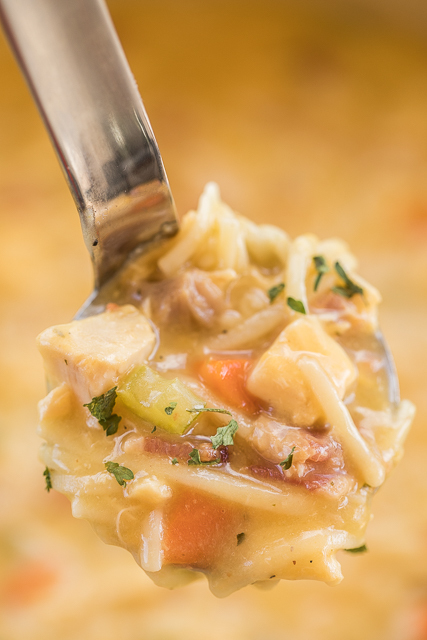 This Crack Chicken Noodle Soup is ridiculously good. We ate this for lunch and dinner the same day. We just couldn't get enough of it! 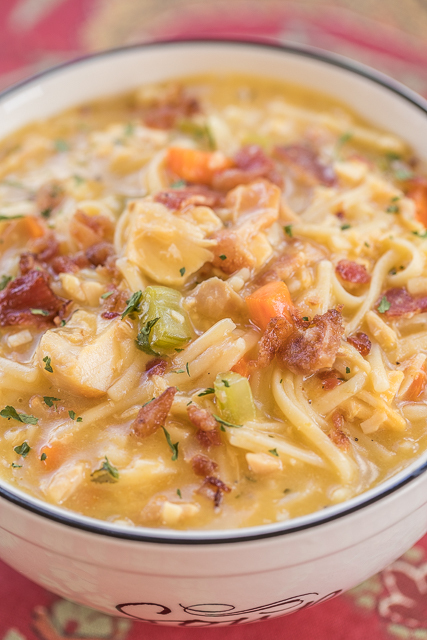 Chicken Noodle Soup loaded with cheddar, bacon and ranch. I mean, how could this be bad?!?!? This not only tastes great, it is also super easy to make. PLUS it is ready in under 30 minutes. Quick, easy and delicious - my three favorite things! To cut down on the prep time of this Crack Chicken Noodle Soup, I used rotisserie chicken for the cooked chicken. Rotisserie chicken is my favorite short cut. I always have at least two shredded chickens in the freezer at all times. 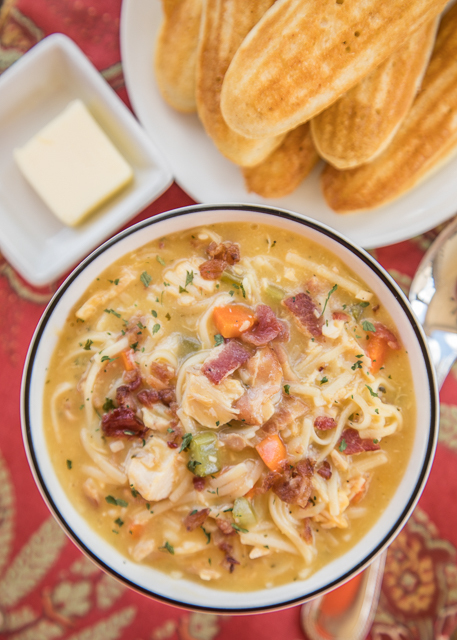 I need to warn you that this Crack Chicken Noodle Soup is highly addictive. Chicken Legs has already requested it again this weekend. I can’t wait!!! We like to serve it with some cornbread or a crusty roll and butter. In a large stockpot/Dutch oven, combine cooked chicken, cheese soup, chicken broth, milk, chopped celery, sliced carrots,Hidden Valley Original Ranch Salad Dressing & Seasoning Mix and Oscar Mayer Real Bacon Bits. Bring to a boil over medium-high heat. Reduce heat to simmer and cook for 20 to 25 minutes, until vegetables are soft. Stir in dried noodles and shredded cheddar cheese. Cook for 5 minutes, until noodles are soft. By the way, the 'crack potato soup' is to die for!!! But I have a (silly) question - what is the dried noodles?? You mean like regular egg noodles?? I'm such a dunce!! Yes Donna, I would believe egg noodles.. those skinny small ones, like in the picture. The egg noodles are with the other dried pasta (regular uncooked pasta in the boxes and bags) - I used the fine egg noodles. I used regular egg noodles. It worked out fine. Great recipe, thanks for sharing! thanks Randee - I need to be more attentive and look at the picture!! Well it's early and cold so that's my excuse. Going to make this though it sounds yum!!! Happy New Year to you!!! What could I use in place of the condensed cheese soup? I saw this yesterday and plan on making it today. I have my cooked chicken and veggies all cut up. How could this be done in the slow cooker? Dump everything for high 6 hours maybe? Add chicken in towards the end? Can I still add the noodles? I'd just dump it all in - except the noodles - and cook on LOW for 6 to 8 hours. Dump the noodles in the slow cooker about 30 minutes before serving the soup. I have all the fixings to do this today. How can I do this is in the crockpot temp and hours? Maybe add chicken when almost done since its cooked already? I was wondering the same. We have a dairy allergy in our family...that’s the only thing I see so far that would be an issue. (And of course the shredded cheese)... Ideas?? I have a dairy allergy as well (& gluten), I found a recipe to make condensed cheese soup that calls for butter and cheese but I'm going to make it with vegan butter and goat cheddar (which I have no problem with) or nut cheese and see how it turns out. I also have found a really good dairy free dry ranch dressing mix (or you can make your own I guess), but this one is by The Spice Hunter and it's organic. This is so hearty looking, I could dive right in. Hi! I plan on making this tonight! I am going to 1 1/2 times the recipe so there is enough to go around! 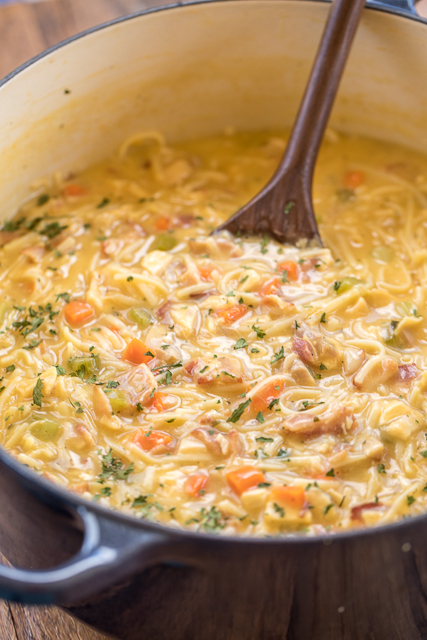 Quick question… Can I used cooked egg noodles instead of dried noodles… My kids don't like the pasty taste of the noodles when I cook it in the soup broth.. If you think it's OK, do I need to make any changes to the existing recipe? Thanks so much! I guess that would be fine. Steph, so I made this on Saturday - took a bit out for the Missionaries (they say thank you for all the goodies!!) and we - me and hubby - ate the rest. Oh my gosh - to totally die for!! So so good. 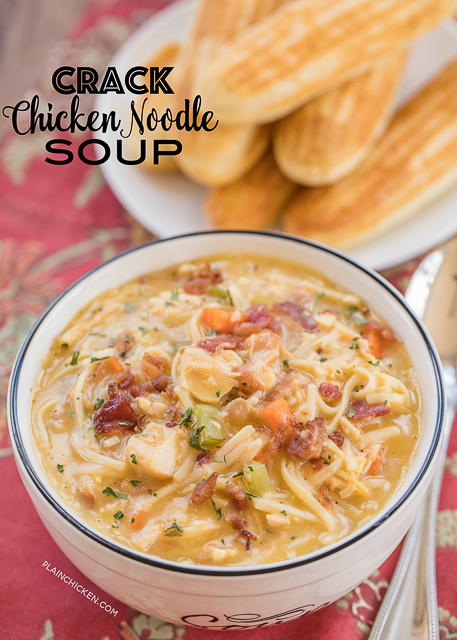 Not the typical chicken noodle soup (sorry Campbells!!) but totally delish, thick, and did I mention delish!! Thank you again for all the good things you share!! I made this last night and it was incredible. I used condensed broccoli cheese soup since I couldn't find plain condensed cheese soup and ommitted the shredded cheddar (only because it was amazing enough without it and I didn't need the extra calories). Thank you for another fantastic recipe! This was good but a little bland for our taste. I added poultry seasoning and it turned out great! Thank you so much for sharing this recipe. It will go in our rotation for sure. I think the leftovers would freeze fine. You might need to add a touch of chicken broth or water when you reheat it. Sometimes the noodles absorb some of the liquid when the soup sits. Why? It only takes about 20 minutes on the stove. It would take at least that long in the IP when you heat it up and release the steam. You probably will need to adjust the liquid amounts if you try it. Holy Chicken Soup! Amazing! By far the best chicken soup I have every had and my dinner guests agreed. Thank you for creating & sharing. I did make it in the CP for 6 hrs on low and it came out perfect. I made this in an instant pot last night. it was supper convenient, especially since i was cooking the chicken in it before hand instead if using rotisserie. After the chicken was cooked and shredded I added everything but the cheese and milk and cooked it for 4 minutes, then did a quick release. Then I just stirred in the milk and cheese, turned out great! While very different than our usual, your version looks delicious and I like how hearty it is. Made this tonight and it was a winner. My husband ate two bowls and said I could make it anytime. That is a high complement from him as he is very picky. I froze the leftovers, so I will see how that goes. The only thing I would change is I would not add the bacon next time, as it was a little salty for me and I don't think the bacon added anything to the soup. Definitely a recipe worth keeping. Could you use canned chicken in place of "real" chicken? Sure! If you prefer the canned chicken, you should definitely use it. Enjoy! Could you use canned chicken? Or would you recommend against that? Should be just fine with the canned chicken. Enjoy! Could you sub white rice for the noodles for this? We do not have ‘Cheese’ soup or ‘Ranch’ salad dressing in Australia. "....what can I substitute them with? Going to make this over the weekend. My family prefers creamy soups over broth based ones. Does this soup get a little creamy? If not, has anyone tried adding cornstarch or making a roux? Just made this--me and my hubby love it! Both for the taste & ease of prep. Thanks for sharing! Has anyone figured out the nutritional information for this? Have you tried it with zucchini noodles instead of the egg noodles? This has got to be the best chicken recipe ever! I see it every where and people are nuts over it. I am going to try. In my opinion -- it is!!! Yummy!! This was amazing, we had it for dinner tonight. This stuff is insane good! I have been making it weekly! Nope. Not a typo. Each packet of dry ranch dressing mix is 1-ounce. I have a few canned chicken noodle soups, can I use those and add the rest? Looks good. Have you made it in a slow cooker? if so how long and did you add everything at the beginning? Instead of egg noodles, would you think orzo pasta would be a good substitute? Just to give it a little more thickness I would guess?? will the noodles soak up all the soup or become too mushy if I make enough for a couple of days ? I did not have the cheese soup so I substituted cream of mushroom and added some cheddar cheese to it. It worked out great and taste wonderful. Thanks for the recipe. In the photo, it appears that you have used spaghetti noodles, is this correct? So this soup is delicious I did make a few changes just based on our tastes. First, I fried the bacon in my lodge dutch oven and reserved 2 tbs of the drippings. Second, I used the reserved drippings to cook the veggies until soft then added the ranch packet and stirred once well incorporated I added chicken stock to deglaze the pan. Third, I didn't have cream of cheddar soup, so, I used cream of chicken. Lastly I used half and half instead of milk, and added it just before adding the cheese and noodles. Not bland at all, definitely a keeper. Even my super picky 5 year old loved it. I made this last nigh and my husband and I enjoyed it. It was full of flavor and a real quick and easy weekday meal. Question: today I noticed the liquid had mostly absorbed. Do you suggest adding more chicken broth? You can definitely add more chicken broth when reheating if it is too thick. I have miso. Broth, could i use that ,with the chicken broth, or instead of? Sounds great cant wait to try it on this snowy afternoon. Technically it should be fine. Be aware that it will totally change the flavor profile of the soup.